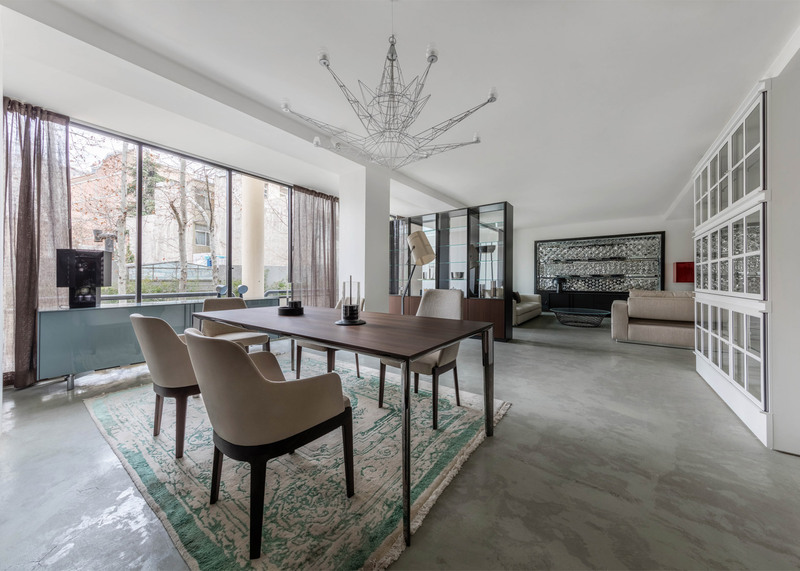 Italian luxury brand Molteni has opened a flagship showroom in the Iranian capital, describing itself as a "pioneer" for design companies moving into the country following the lifting of trade embargoes earlier this year. Molteni Group – which owns the Molteni&C furniture company, as well as the Dada and Armani Dada luxury kitchen brands – teamed up with Iranian company Ravagh Home to launch Molteni Persia in Tehran. It is the brand's first major showroom in Iran – a country that is currently experiencing a boom in architecture and design, thanks to an expanding economy and a growing demand for contemporary lifestyles. Open since May, the showroom takes up two floors of a 1,000-square-metre former Belgian embassy building at 82 Fereshteh, near the city centre. The upper floors of the renovated building will be used for art exhibitions. "We are the first [Italian brand] investing that much in this market," said Marco Piscitelli, Molteni's general manager. "We consider ourselves like a pioneer," he told Dezeen. "There are some of our competitors there also, or trying now to approach the market, but I am proud to say that we are the best in town because we started to study the market early." The Italian company believes the burgeoning Iranian market will generate between €4 million (£3 million) and €5 million (£3.8 million) in income from its design brands over the next three years. Molteni and a small number of other Italian brands like Flos and Alessi previously had a limited presence in Iran through dealers who skirted international trade embargoes by importing through Dubai. But the lifting of these sanctions at the beginning of 2016 is opening the country up to European brands. "Iranians are super hungry about design and Italian brands in general," said Piscitelli, although he added that the percentage of the population that was interested in high-end Italian design as still relatively small compared to places like India and China. "It's very thin compared to other countries," he said. "But it's just a matter of time I think. I assume that in the next 10 years we will hear a lot about this country from Italian brands." According to local architects, Iran is entering "a new era for architecture". Molteni is aiming to ride this wave of investment by fitting out major new construction projects in the country, as well as by providing furnishings for private customers. "Our partner is very well connected to a certain niche of clientele which brings them projects, residential mainly, but even hospitality, which is another part that could grow in Tehran because since they opened the market everything is becoming more easy and even more attractive," said Piscitelli. Customers in Tehran are more likely to turn to a brand to fit out their entire home, than to buy a single sofa or table as they would in Europe, added Piscitelli. He said that the company's Armani Dada kitchens in particular were attracting a lot of attention in Tehran. "Armani has a lot of appeal because Armani is Armani," he said. "It has brought us a lot of notoriety in town." "In general they are very attracted by the name of a designer. It's a kind of added value on a product or a brand which is already of value." Founded in 1934, the Molteni&C furniture range includes a number of pieces designed by Italian architect Gio Ponti, who also designed a house in Tehran called Villa Nemazee in 1964. Molteni&C also has more recent product ranges designed in collaboration with names like Norman Foster, Patricia Urquiola and Jean Nouvel. In April, the Molteni Group appointed Belgian architect and designer Vincent Van Duysen as its creative director. Giulia Molteni, the brand's head of marketing and communication, told Dezeen that his appointment would help the family-run company distinguish itself from other Italian brands.